There is an obvious shift in today’s work environments as companies compete for the next workforce generation. Whether it is a startup using a picnic table as a make-shift benching solution or a tech giant building a campus with more amenities than most all-inclusive resorts, today’s most desirable work environments offer their employees choices that were not available in the past. A recent Fast Company article suggests, however, that one size does not necessarily fit all. Different jobs—and even job-related tasks–require different tools on a daily basis. 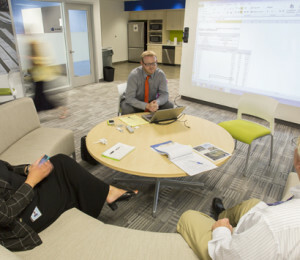 Ensuring that the right mix of collaborative spaces, focused work rooms, and technology is available on an as-needed basis is essential to a productive, innovative, and satisfied workforce, according to the article. At the Progressive AE headquarters in Grand Rapids, Michigan, we have experimented with spatial configurations and custom furniture in search of solutions that support the needs of our staff (and clients). Critical to our success is a thorough understanding of our client gleaned early in the design process through an active visioning session. During these meetings, clients are encouraged to participate in the discovery process through a series of activities. We have found that the typical enclosed conference room inhibited the flexibility needed and ultimately, the overall success of the visioning exercise. Because of this, we established a more ideal venue to support large team collaboration in the form of Collab One—a semi-enclosed space built around a 30 foot x 8 foot whiteboard wall framed by a large tack board on one end and a projection screen opposite. This collaboration space has proven to be the perfect balance of privacy, flexibility, and transparency. In addition to Collab One, we have designed specific furniture pieces to tailor to the notion of providing appropriate tools for each unique job task. Born from a need for a small teaming zone, Spare Table provides a large, flat work surface with ample space for two to four individuals. Constructed with a single reclaimed bowling lane and bicycle “legs” provide the mobility needed to allow the table to maneuver around the office as needed. The camaraderie and ease of collaboration proved to be a great benefit of working in such close proximity, and encouraged our design staff to continue to explore how this work setting could be incorporated into day-to-day life. The result was designBENCH, intended to support the entire architectural design staff. By minimizing visual barriers and reducing the personal work space footprint, designBENCH fosters collaboration at all scales, from screen sharing to department brainstorming sessions. 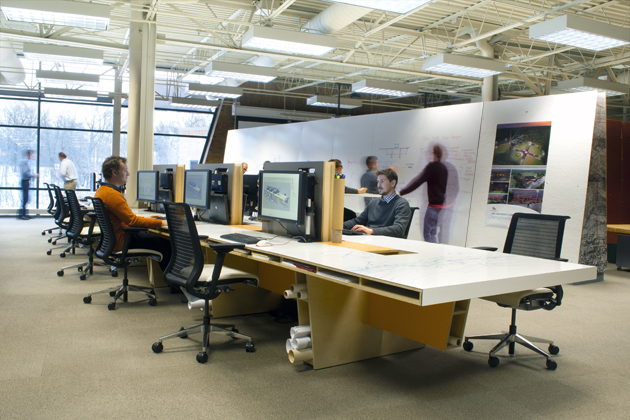 designBENCH provides eight individual 4’ wide personal workspaces and a collaborative meeting space at the end. The next step in the evolution of our work place is a transformation to incorporate a casual client engagement zone at the entry, refreshed hospitality and adjacent cafe, and an additional large group collaboration space to compliment Collab One.